The Out of Darkness Family Bundle Pack consists of 10 DVDs and is a great savings. There is something here for the whole Family including presentations by Michael Imhotep founder of The African History Network. Remember, right knowledge corrects wrong behavior. "Out of Darkness" is a full length three-part documentary by director Amadeuz Christ (Δ+), examining the untold history of African people, the African cultural contribution to the nations of the world, and the events that have contributed to the condition of African people today. Out of Darkness will explore the Nubian/Kushitic origins of Nile Valley Civilization, contact between Africa and the Americas since the times of antiquity, as well as the influence of the Moors in Europe leading to Europe’s intellectual Renaissance. In addition, the film will analyze the history of modern day racism, the concept of “white supremacy,” the impact of Hip Hop as a social movement, and the idea of nationhood. In the Extended Version see the full director’s cut of Out of Darkness, with five additional chapters (Burden of Proof, Out of Afrika, Post-Trauma, Illusion of Inclusion, & Illuminati) not shown in the Theatrical Version. These additional chapters further detail the Kushitic origins of Ancient Kemet (Egypt), explore the contact between Ancient Africa and Ancient America, as well as the psychology of multi-generational trauma and it’s relation to the history white supremacy. Out of Darkness is narrated by Prof. Kaba Kamene and co-stars Dr. Umar Johnson, Dr. Claud Anderson, Tim Wise, Prof. James Small, Dr. Joy DeGruy, Anthony Browder, Sabir Bey, Atlantis Browder, and Taj Tarik Bey. "Resurrecting Black Wall Street The Blueprint Documentary 2016 feat. Michael Imhotep" This is a documentary released in March 2016 featuring Michael Imhotep founder of The African History Network. Before Dr. Martin Luther King Jr. was murdered by the government, he’d begun to explore the deep impact that economic inequality had on his ability to affect social change. Dr. King found that, if we do not address financial wrongs of the past, we will not be able to fulfill the dream that many of us share today. “Resurrecting Black Wall Street: The Blueprint” examines Little Africa of Tulsa Oklahoma in 1921 as a shining example of what black people can accomplish when we pursue our economic goals as a collective. Featuring leading financial scholars, historians and activists, the film allows us to study the body of knowledge left behind by our ancestors in order to move on to a more empowered future. Principles of cooperative economics, wealth building, and black business development are addressed, along with the TRUTH about what happened to the people who had their wealth stolen and their story buried for over 100 years. "Black Friday What Legacy Will You Leave" - The documentary, "Black Friday", takes an in depth look into the spending habits of African-Americans in America. The film chronicles the financial mis-education of many African-Americans and explores the economic pitfalls that continue to derail the progress of the community-at-large. In an effort to heighten the economic awareness and financial responsibility in the community, the film, Black Friday, presents solutions on how to better manage the $1.2 Trillion dollars that leaves African-American communities annually. In addition, the film champions the importance of leaving a financial and ethical legacy for the next generation. 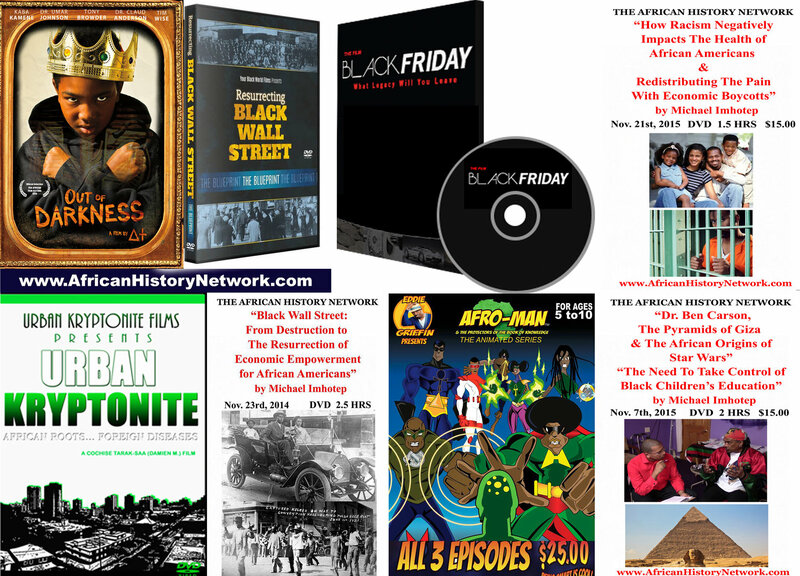 Featured in the documentary are Rapper/Activist David Banner, Michael Imhotep founder of The African History Network and host of “The Michael Imhotep Show”, Dr. Claud Anderson, Dr. Umar Johnson, Prof. Kaba Kamene, Tony Browder, Hill Harper, Johnnie Gill, Judge Glenda, Hatchett, Cynthia Bailey, Dr. George, C. Fraser, Dave Anderson founder of The Empowerment Radio Network, Atty. Warren Ballentine and more. "Urban Kryptonite: African Roots, Foreign Diseases" is the first health documentary ever to delve deep into the mystifying quandary of disease and death in the African and African Diaspora community. Statistics show that African Americans comprise approximately 14% of the United States' national population. Yet they suffer disproportionately from a myriad of diseases that are maladroitly believed to be "genetic." Oddly enough there is no empirical data linking the ancient ancestral continental Africans to many of these modern day so­-called diseases. Contrary to conventional wisdom enslaved Africans did not arrive to the shores of the Americas as a sick people. This film addresses all of the folklore and propaganda associated with sickness in the black community. After viewing this film there will be zero doubt in the minds of melanated African descendants worldwide as to what they should eat, drink and do to promote life longevity. "Afro-Man & The Protector of The Book of Knowledge" - Animated Series for Ages 5-10. Get all 3 Episodes in this Bundle Pack. These are African-American Superheros that are entertaining for our children but teach them about their history as well. Children love this series and watch the episodes over and over again. "Black Wall Street: From Destruction To The Resurrection of Economic Empowerment Michael Imhotep", Rec. Nov. 23rd, 2014, This presentation from Michael Imhotep host of “The Michael Imhotep Show” and founder of The African History Network deals with a lot of the little known history of North Tulsa, Oklahoma and it’s African American business district called The Greenwood District or “Black Wall Street”. We had 35 blocks of over 600 businesses in the early 1900s. The real history of Black Wall Street is not very well known and even lesser known is the fact that inspite of insurmountable odds, we rebuilt Black Wall Street after the Race Riot of June 1921. Topics Covered in this presentation: - A Timeline of history leading up to June 1921. - The origins of Tulasa, Oklahoma which was settled by Creek Indians around 1836. - The Black Freedmen Indian Treaty of 1866. This treaty is being enforced for White Indians but not for Africans Americans who qualify. - Did you know that all “5 Civilized Tribes of Native Americans” owned Black Slaves? - Black Wall Street was rebuilt after 1921. - What really destroyed Black Wall Street? It was not the Race Riot. Michael Imhotep is also featured in the new documentary on "Resurrecting Black Wall Street" from Your Black World Films realeased in March 2016. "How Racism Negatively Impacts The Health of African Americans & Redistributing The Pain Boycotts" by Michael Imhotep Recorded November 21st, 2015 in Detroit. Michael Imhotep cites studies and articles showing some of the ways Racism effects the health of African Americans and what we can do about it. He also deals Dr. King's last speech "I've Been To The Mountaintop" where he discusses Redistributing The Pain Through Economic Boycotts and how we can use that today.